The Colorado Independent, the state’s left-leaning independent news website, posted an early report of the Denver District Attorney race to replace term-limited Mitch Morrissey, who will complete his 12-year run in November 2016. Susan Greene, one of Colorado’s premier investigative journalists covering many criminal justice stories during her career at the Denver Post, interviewed the three candidates identified to replace Morrissey – Michael Carrigan, CU Regent; Beth McCann, State Representative; and Kenneth Boyd, a current Chief Deputy DA. Greene believes the main issue will be police misconduct and failure to prosecute in the matter of the police shootings in Ferguson, Staten Island, South Carolina and Baltimore. The leading local case is Jessica Hernandez, an unarmed 17-year old girl killed by Denver police in late January. And, indeed, the three candidates, all Democrats, offer some criticism of Morrissey on the police prosecution issue, but it’s relatively mild. They all advocate more engagement and transparency, implying Morrissey does not offer enough. McCann, as a former state attorney and Denver Manager of Safety, takes the most centrist position, balancing her statements about more aggressive investigations and police prosecution with the public’s concern over gang violence. Carrigan, the frontrunner with many early liberal establishment endorsements, is the most aggressive critic, but tempers it by stating the obvious fact that he doesn’t have all the evidence to second-guess Morrissey’s decisions. But, he proceeds to say that recent jury awards raise questions and that the investigative process takes too long and lacks transparency. The police misconduct issue in city politics is fraught with danger for local politicians. When New York City Mayor Bill de Blasio campaigned against stop-and-frisk police practices and appeared sympathetic to protesters after the Staten Island decision to not indict in the Ed Garner death (“I can’t breathe”), the police union began its own high-profile campaign of protest. Probably the most damaging recent event to Denver’s reputation was the gang violence reported on the front page of the Denver Post, above-the-fold. The story highlighted the threat people felt in the new gentrified neighborhoods of Denver. If the DA candidates intend on framing the election around police misconduct, they may be surprised that Denverites, both north and south of 6th Avenue, want their prosecutor very focused on gang violence and crime in general. Mention the words “growth” and “development” in Denver and there is an immediate reaction. In describing the anti-development subtext of the recent Denver City Council races, it generated interesting Facebook commentaries. A Butch Montoya comment on the Susan Shepherd, District 1, loss brought in a Hilltop response about congestion, traffic and safety, and a Belcaro/Washington Park reference to the child killed across from the Bonnie Brae Ice Cream shop. The exceptional growth spurt (50,000 people added from 2010 to 2013) will taper off, but the City has been a magnet for suburbanites returning neighborhoods, such as Cherry Creek; young families moving into Stapleton and Lowry; and Millennials and Gen Xers filling up LoDo and the Highlands. (See The Buzz: Roiling under the surface (May 8) and Denver Development (March 9)). As this blog has described, it will require a careful balance to ensure Denver doesn’t become inhospitable to new and improved housing or jobs while ratcheting up protection for neighborhoods. Henry Dubroff and John Huggins use the planning process related to the Denver Central Library as an example of the type of commitment needed to keep Denver’s major civic projects moving ahead, while responding to neighbors’ concerns. It is a thoughtful analysis, but the Library’s public process was greater than just architectural design, which they emphasize in the Denver Post column (Dubroff and Huggins: Drawing on experience, 5-17-15). The public process that accompanied the Denver Central Library project started with site selection, arrangement of the building to protect the historical front (north side), and finally the size and cost of the final design. Meetings with Capitol Hill, Golden Triangle, historical preservation, and city finance and elected officials were extensive and stretched over more than a year. The project had a host of significant advocates. Along with the administration, City Council leaders, such as Cathy Reynolds and city auditor and future mayor, Wellington Webb, were ceaseless in pushing the project forward. Our firm represented the Denver Central Library as it prepared for the $92 million bond campaign, which was held in the August 1990 Denver party primary election. The baseball stadium also decided to go in August on the six-county ballot (pre-Broomfield). The Library was a user of Mayor Federico Peña’s new neighborhood and major project process that was inaugurated after his election in 1983. Previously, neighborhoods angry over city hall decisions felt their complaints were ignored. The new process gave them considerable sway over a host of planned major infrastructure investments. Aware that getting voter approval of major projects required a public buy-in, the Peña administration threw itself into tiring, and in some cases tiresome, public consulting processes that mostly produced success. The Library’s $92 million bond passed by 75 percent in the 1990 election. The behemoth international Clinton Foundation, and premiere liberal think tank, the Center for American Progress (CAP), are both barely ten years old, but now offer a new model on how to run for president in the 21st century, and, especially, the post-Obama era. They are essential tools in what has become a global influence network and billion-dollar quest for the White House. Since its beginning in 2001, the Clinton Foundation has evolved into a multi-pronged charitable effort that has raised $2 billion throughout its fourteen-year-and-counting existence. Because of foreign donations, transparency issues and conflict of interest charges, it has become a controversy for Hillary Clinton’s presidential campaign. Still, the foundation, and especially the Clinton Global Initiative, which is an international schmooze-fest in the tradition of Davos, has been a huge asset for the Clintons and their ambitions. The foundation also has benefitted the Clinton’s lavish lifestyles by boosting their prominence and corporate and civic networks, and led to millions in speaking fees. The annual Clinton Global Initiative (CGI) meeting is a platform for business leaders, top media members, non-profit directors, global billionaires, glitterati and a sprinkling of Nobel Laureates. Like Davos, the contacts, exchange of ideas and in CGI language “Commitments to Action,” which are initiatives for charitable activity, has linked the former president and the former secretary of state into a global network that is greatly facilitating the transition to a presidential campaign and, potentially, the White House. Founded in 2003 by Bill Clinton’s last White House Chief of Staff, John Podesta, CAP has been compared to the influential Heritage Foundation in the late 1970s and its power in the Reagan era. CAP gained a national reputation in 2008 when it provided liberal Democrats with many of their talking points and policy ideas. President-elect Obama then outsourced his administrative transition to Podesta and CAP. Its budget has grown from $25 million in 2008 to $40 million today. Similar to CGI, some of CAP’s money is a source of criticism, with concerns over conflicts of interest and transparency. The think tank and associated political action committees have done well during the Obama years, providing ideas, reams of policy research (on such topics as global warming – one of Podesta’s personal interests), advocacy and personnel. The highest profile person among dozens of CAP staff working in the administration is Podesta himself, as counselor to the President. Denis McDonough, current Chief of Staff, is a close second. CAP has smoothly moved to take over the Hillary Clinton campaign, with Podesta as campaign chair (he launched the campaign on Twitter) and Jennifer Palmieri, former CAP communications senior staff and Obama’s White House communications director – now serving as Clinton’s head of press and communications. A serious run for the White House requires a global and domestic network of leaders and intellectuals, familiarity with global and domestic issues, and masses of cash. These two organizations provide the Clintons, and especially the presumptive Democratic nominee – Hillary Clinton – very powerful platforms from which to operate. President Obama’s national approval rating has improved slightly since last fall’s election when it stood at 42 percent and contributed to the November across-the-board Democratic debacle, from U.S. Senators and governors to state houses. Today, the President’s rating is 45 percent. Generally, along with the state of the economy, the President’s approval rating is the most significant factor in the election of a Democratic successor; that is, Hillary Clinton. Forty-five percent is considered below the political “Mendoza line” as described by Amy Walters in the May 13, 2015 Cook Report. “The magic number for Obama – and ultimately Hillary’s chances – is somewhere around 47 percent.” Obama’s current approval is just on the cusp of being deadly. 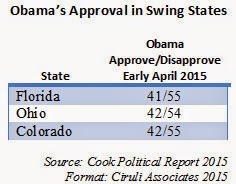 Using Quinnipiac polling, the Cook Report shows that in several swing states, Obama is well below his 45 percent national approval average. The other political trend that has been strengthened in recent years is the fact U.S. Senate races are more tied to the presidential race than in the past. The fate of Senator Bennet will be significantly affected by President Obama’s approval rating and the quality of Hillary Clinton’s campaign. Out of the dozen or so theories as to why the British pollsters crashed and burned in the May 7th parliamentary election is that the culprit is the marriage of intense polling (poll-of-polls) and the subsequent media narrative with American-style stealth targeted big data campaigns, the kind brilliantly ran by Jim Messina, Mr. Obama’s 2012 campaign manager, who helped direct Prime Minister David Cameron’s Conservatives. Read more about the British polling debacle in the Denver Post, May 16, 2015: Ciruli: Election polls face a crisis of confidence. The report was reprinted in the PollingReport.com website, with a host of other analyses of problems with British polls. George Stephanopoulos has damaged ABC News just as it begins its 2016 presidential coverage. Like Brian Williams, he has possibly ended his career as the lead network news anchor. Giving money to the Clinton Foundation and participating in the Clinton Global Initiative was a mistake that will be very hard to recover from as the 2106 presidential election begins. ABC News needs to have the full confidence of its audience and at least the acquiesce of the Republican Party, both of which are in doubt now. Even if the charitable giving could be ignored, failing to disclose it while grilling “Clinton Cash” author Peter Schweizer, was a serious violation of journalistic ethics and good judgment. But Stephanopoulos was also active with the CGI, which is essentially a global networking apparatus for the Clintons and largely lets the American and worldwide left schmooze while also trying to link up with more conservative leaders who like to be in the political action and promote their charitable interests. Timing is everything and Stephanopoulos’ could not have been worse. 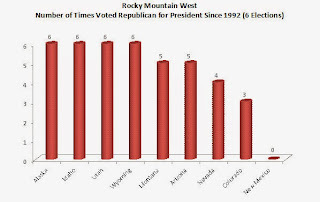 Beginning with Bill Clinton’s election in 1992, Colorado is the Mountain West state that has shifted positions the most between the two parties. New Mexico is the most Democratic-leaning western state voting Democratic tickets all six times. 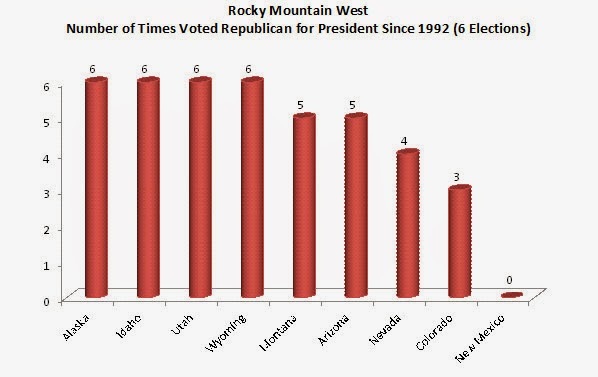 The four western states the most dependably Republican are Alaska, Idaho, Utah and Wyoming, never missing a chance to vote for a Republican nominee. Colorado, with its three Democratic votes – Bill Clinton in 1992 and Barack Obama twice (2008 and 2012) – and Republican in the other three elections (Dole 1996 and G.W. Bush 2000 and 2004), will be the most fought over in the 2016 election. Nevada is our closest neighbor in terms of being competitive, but leaning Democratic. It gave Clinton two narrow wins in the 1990s, supported Bush twice, and then provided big wins for Obama in 2008 (12 points) and 2012 (6 points). Colorado voters can expect to see a lot of TV advertising in 2016. 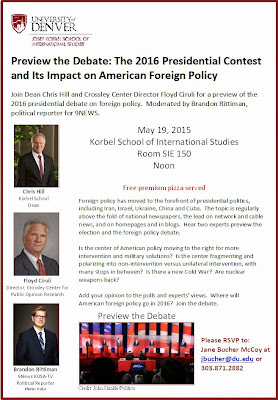 The Korbel School of International Studies will present dean and former ambassador, Chris Hill, and Floyd Ciruli, director of the Crossley Center for Public Opinion Research, in a preview of the upcoming presidential debates on foreign policy. 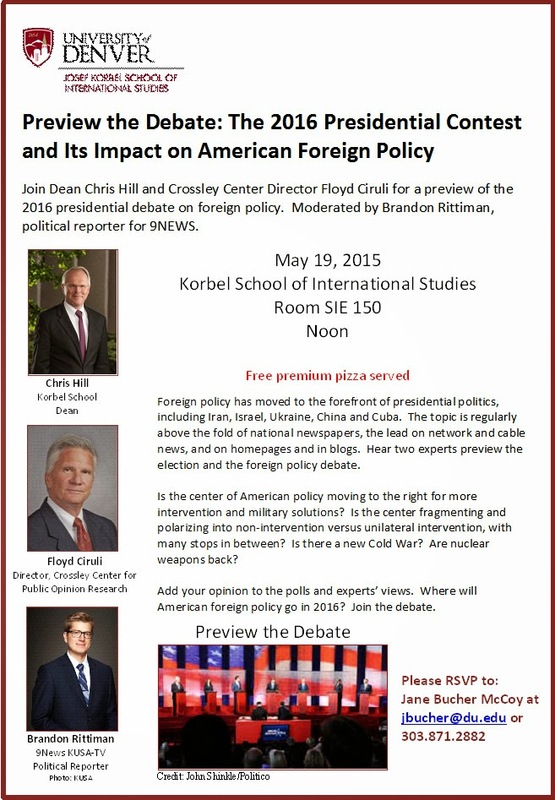 The discussion will be moderated by 9-News political reporter, Brandon Rittiman, the recent winner of the prestigious Walker Cronkite Award for Excellence in TV Political Journalism. The director of the Norman Lear Center at USC just wrote stout defense of local TV news for the value of its political coverage and cited 9-News Brandon Rittiman and Kyle Clark for their 2014 debate coverage and truth tests. Read the release of Marty Kaplan on the award, local news, and Brandon and Kyle. The president of Poland was expected to win re-election without a runoff, but instead, he came in second behind a conservative challenger and former member of his own center-right party. President Bronislaw Komorowski won 32.2 percent of the vote against further right candidate, Andrzej Duda. The runoff election is in two weeks. Polls had shown the President in the lead and likely to win outright with a majority of the vote. And, although his numbers had slipped the last month, he remained ahead. May polls showed Duda with an average of 27 percent support and in second place by an average of 9 points behind Komorowski, whose polling support averaged 38 percent during May. Duda, a relatively unknown European Parliament member, represents the Law and Justice Party, the country’s more anti-EU, anti-German party and critical of Russia. Komorowski, a well-respected communist dissident, represents the Civic Platform Party, which has been in power eight years. In spite of a fast growing economy, a substantial protest vote emerged, even beyond the Duda vote. A former rock musician ran an anti-establishment campaign advocating changing the voting system from party-controlled to candidate centered. 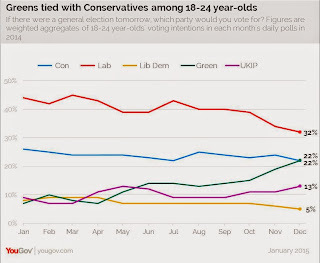 Left wing parties failed to register with voters. Turnout was exceptionally low, less than half the electorate (48.8%). A sceptic might suggest Raúl Castro’s sudden passion for Catholicism is more related to the lack of popularity of the Castro brothers than a desire to attend Mass. 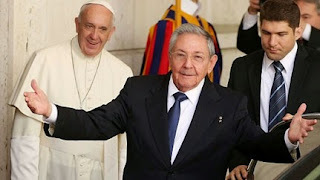 Pope Francis has an 80 percent favorable rating whereas Raúl has a 47 percent and Fidel Castro a 44 percent. Associating with Pope Francis has its rewards. The Polling Report, one of the country’s top political website covering public opinion, published our latest analysis on the recent stealth poll done in Cuba without the government’s approval. The Castro Brothers in Trouble can be found here. The Colorado State legislative session, which just ended, managed to avoid a serious debate on fracking because Democrats believe it is a losing issue for their party in 2016. The session passed one bill aimed to cause discomfort among anti-frackers and other advocates of appealing ballot issues that have dramatic impact on the state’s economy. House Bill 1057 will require a fiscal impact statement for all initiatives. Pro-fracking forces commenced a study last year that showed a fracking ban would cause the loss of tens of millions of dollars and tens of thousands of jobs. Valerie Richardson, who writes regularly for Washington D.C. news outlets, is now writing stories for the new publisher of the Colorado Statesman. Read her fracking article here. 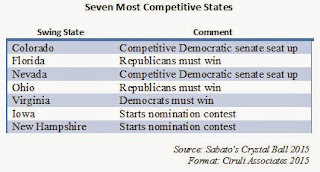 Larry Sabato’s Crystal Ball team just picked the seven states that appear most competitive in the 2016 presidential contest. Colorado may be the most competitive, but it is joined by six others. The top five have voted twice Republican and twice Democrat for president since G.W. Bush’s contested victory in 2000. Iowa and New Hampshire voted Democrat three out of four times. Colorado is a swing state because on most metrics it is near the center. When Gallup publishes various 50-state lists of voters’ attitudes and values, Colorado is usually at or within four or five states of the center; e.g., partisanship, ideology, religious fervor, and Colorado tends to be near the mean on most policy questions, such as abortion, gay rights, immigration and the Keystone Pipeline. If there is a lean, it’s on the slightly liberal side on social issues and slightly conservative on fiscal issues. Probably the state’s most successful current statewide officeholder, Governor John Hickenlooper, is slightly to the left of the electorate on the two-dimension; i.e., a little more willing to raise taxes and spend money and a little more interested in expanding individual rights, but only slightly. 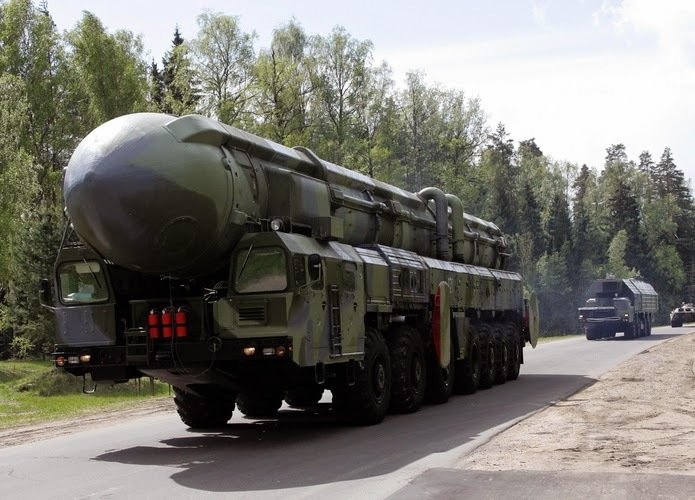 Just when you thought it was safe to ignore the Ukraine and Eastern Europe, while the Minsk II peace accord seemed to be holding, Russia’s president and its leading military leaders have threatened their immediate neighbors and the West in general with nuclear weapons. America’s and the West’s strategy since the fall of communism, and especially in this century, has been based on economic integration, international institutions, rules of law and soft power. Force and even deterrence fell out of favor. Needless to say, Russia and Vladimir Putin are following a more old fashion strategy with many new tactics to expand Russian influence everywhere he can and protect its share of influence everywhere else. In a stunning and unexpected result, the UK Conservative Party swept to a parliamentary victory in Thursday’s national election. The UK polling industry, which included participation from the U.S.’s most famous election polling guru, Nate Silver, was misleadingly off in their final prediction of the overall vote, but especially wrong in their translation of the data into parliamentary seats. One poll that mostly got it right was the exit poll that showed a Conservative near majority (326 seats) in the making and started the beer flowing in Tory pubs. (It appeared the Washington Post was getting some of the election flavor at the Blue Boar, “a swanky restaurant near the Conservative headquarters.” – Washington Post, May 8, 2015). There will be a lot of political casualties. Ed Miliband resigned as Labour leader, Nick Clegg is out as head of the liberal Democrats (the current governing partner) and Nigel Farage of UKIP lost his seat and resigned as party leader. Pollsters will also be on the defensive and, no doubt, start an inquiry. David Hume Kennery, a Pulitzer winning photographer and a friend of President Gerald Ford, shares his access to the White House and Vietnam in a stirring visual essay of the last days of Vietnam (published in Politico). Not only was the war lost, but evacuation was mostly chaos. 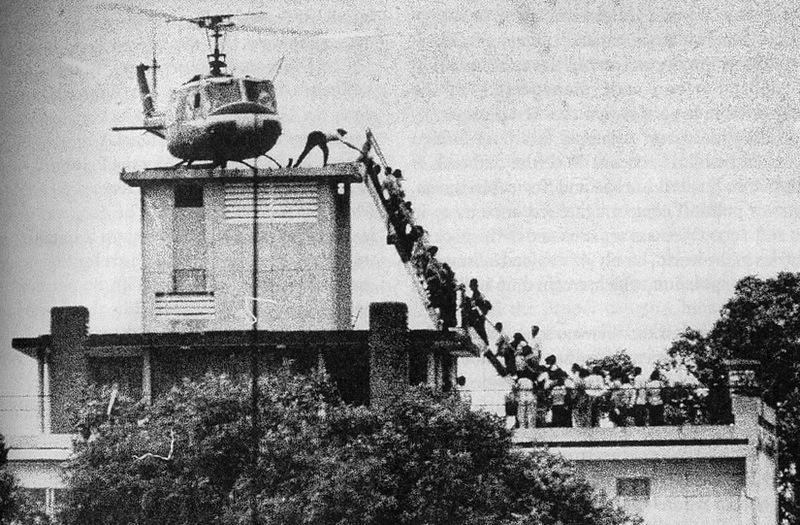 I don’t recall being surprised by the collapse, but the famous picture of Americans and Vietnamese loading into a helicopter on the roof of a CIA building brought it home dramatically. It was clear that they were running for their lives and that it would require dozens more helicopters to complete the job. You sensed immediately many would be left behind. The Denver Post’s Jon Murray got to sort through the conflicting messages among Denver voters who re-elected a host of Denver city officeholders, but exercised harsh judgment on one incumbent, City Councilperson Susan Shepherd, losing two-to-one, and rejected Chris Nevitt, thought to be an easy win for auditor, losing to little known and underfunded Tim O’Brien. It probably sends an effective warning to the Denver political class to not interpret the placid election and most of its results as general satisfaction with the status quo. Like most places in the U.S. and the world, there’s protest in the air. One of the few themes in the election captured by the Denver Post was that the city’s recent growth surge has irritated neighbors, congested traffic and produced a backlash, which will make the next city council less friendly toward development. Political analyst Floyd Ciruli said such issues illustrate the flip side of Denver's recent success. “In general, this looks like an election where the biggest complaint is that we're doing too well,” Ciruli said. The presidential primary bill died in the Colorado Senate. It would have made next year’s contest more entertaining and engaged a few more Republicans, but it was expensive (at least $1.7 million). Fortunately for Colorado voters who like their politics intense, the state already has a top-rated status as a battleground for the general election. The Denver Post referenced The Buzz in regretting the legislature’s failure to act. There are doubts about the honesty of the Clintons. Since the day they entered the national media stage, scandals have framed the careers of Bill and Hillary Clinton, from Gennifer Flowers at the start, to Whitewater, Travelgate, Lewinski and Marc Rich. The series has been extended this year as Hillary Clinton starts her campaign with e-mail servers and unreported (and possibly conflicted) foundation contributions. The doubts are registering in polls, and appearing in political commentary and daily speeches of many Republican presidential candidates. One rule to remember about public opinion and honesty in general, and specifically the Clintons, is the public may believe the politician is integrity-challenged and yet still support them. The best example is Bill Clinton. In his worst days in 1998, the public gave him favorability rating in the 30 to 40 percent range, but presidential approval stayed above 60 percent. And in the 1998 midterm election, Democrats gained seats and Speaker of the House Newt Gingrich resigned. Today, Bill Clinton still has a favorability rating above 60 percent. Hillary may be more vulnerable, but the American people are skeptical of the integrity of most politicians. They are willing to overlook much if they like the person or the job they’re doing. And, as the latest WSJ/NBC News poll and NYT/CBS News show, partisanship often trumps honesty. In a very low turnout race where more conservative candidates did better south of 6th Avenue, the Denver Auditor race was the evening’s upset. Denver voters went against the political class and supported the independent candidate, Timothy O’Brien, an actual auditor. Chris Nevitt, a longtime city councilperson, had the endorsements and the money, but not the votes. He lost 47 percent to 53 percent in a citywide race, with only about 100,000 votes cast. 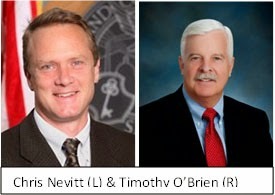 Voters liked incumbent Dennis Gallagher’s independent attitude more than his endorsement of Nevitt. Like its former colony across the Atlantic, the UK parliamentary election is awash in polls and projections as to how many seats will be won by the dozen or so parties. 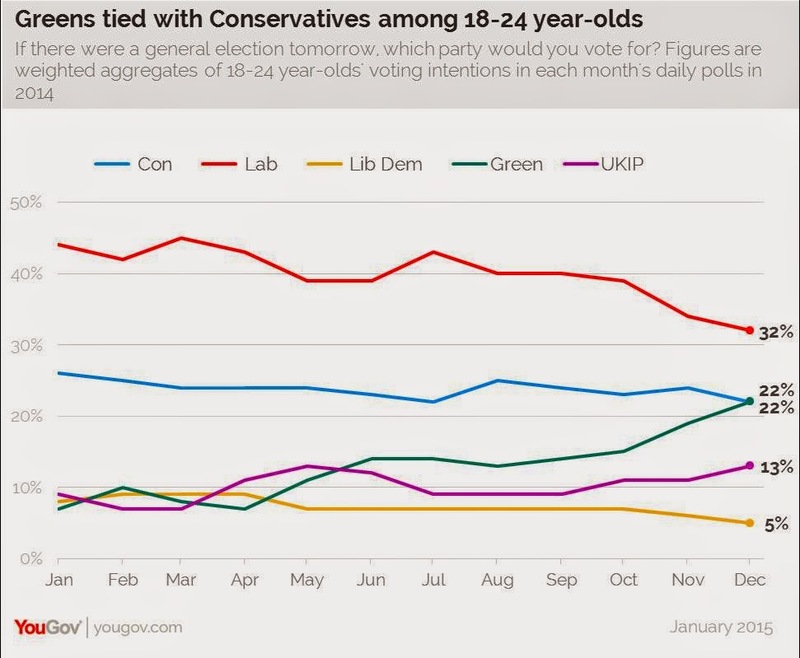 The headlines so far recount the closeness of the race between the two top parties, Conservatives (34%) and Labour (33%), and the fact that together they share barely two-thirds of support from voters, which is down from 90 plus percent during most of the post WWII period. To form a government, the front running party may have to ally with two or more smaller parties. The field of smaller parties has new players. The Scottish National Party is likely to sweep all the seats in Scotland, up from a handful won in the last election (2010). 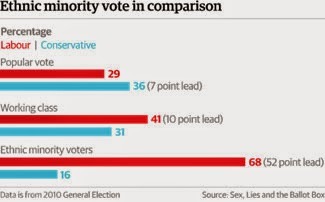 And, an anti-immigrant party, UKIP, that now has more voter support than the Liberal Democrat Party, which after the last election was in third and became part of the government (in spite of more support, UKIP (14%) may receive one to three seats, whereas the Liberals (8%) may win 26 seats due to the single member first past the post voting system). Forming a government requires 326 seats. The third largest bloc in the new parliament will be the Scottish National Party and it is a logical member of a Labour coalition. Most analysts see Conservatives getting the plurality of seats, but having a poorer chance to form a government than Labour. Like elections in most western democracies, protest is in the air with broad based distrust of longtime parties and established politicians. tier Republican has come forward and the recruiting seems to be very offline. Ahead of Colorado in competitiveness is Nevada, ranked fourth after the retirement of Harry Reid. But Nevada Republicans also have not identified a strong candidate. Democrats and Reid are backing a former State Attorney General, Catherine Cortez Masto. Further West, California has an open senate seat with the retirement of Barbara Boxer. But who cares. The state has no serious political party competition. The election on May 7 will mark the beginning of Great Britain’s slide toward less stable government. 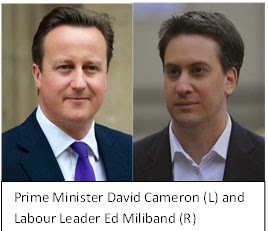 Crossley Scholars have been observing the British election. The most recent report by Gina Jannone and Chelsea Bartholomew follows. With less than a week to go before the May 7 British election, David Cameron’s Conservative Party and Ed Milibrand’s Labour Party remain locked in a tight race. 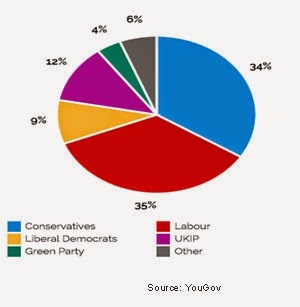 The latest YouGov poll shows Labour picking up 35% support to the Conservatives’ 34%, with Labour picking up 276 parliamentary seats to the Conservatives’ 272. The two have been generally even since late March. The Liberal Democrats, partners in the current Conservative-led coalition government, have seen their support base all but implode and continue to trail the nationalistic, anti-EU Independence Party (UKIP) by three percentage points. 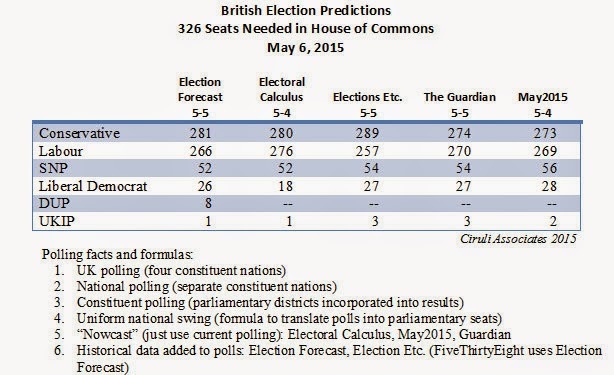 These numbers indicate the potential for a significant destabilization of the current coalition government. Meanwhile, new polling shows Nicola Sturgeon’s Scottish National Party (SNP) on course to pick up all 59 Scottish seats, further highlighting the growing power of the nationalist movement that already initiated a close Scottish independence vote late last year. A potential for an SNP-Labour coalition has been ruled out by leaders of both parties, which could mean the Conservatives and Cameron will benefit from Labour’s loss of support in Scotland. Some analysts are suggesting that Labour’s resurgence of popularity can be attributed to London’s changing demographics. A rise in migrant voters and ethnic minorities in London, along with shifts in population distribution, appear to be providing a boost to Labour’s support in the capital. Given the closeness of the race, the election’s impact on Britain’s role in the EU remains in flux. Cameron has indicated plans to renegotiate Britain’s role in the EU and bring the new terms to vote, while Milibrand has opposed such a plan. Depending on the final results and the potential for a second election or new coalitions, the risk of a British exit from the EU is not out of the picture. Denver will elect and re-elect most of its political establishment on Tuesday – Mayor Hancock, senior City Councilman Chris Nevitt as the new auditor and the re-election of council incumbents. Surprises are possible, but appear unlikely. The only question is will an anti-development trend dominate the multi-candidate open seat races? Thursday, May 7, the UK will hold an election where not only will the two major parties not receive a majority, but they will need not one, but possibly two additional parties to form a government. One of the world’s most stable two-party parliamentary systems has fragmented and became highly unstable. Lots of evidence for opponents to the agreement to argue that Iran is belligerent, arrogant, and in the case of a senior military officer, seriously conspiracy-minded. A few more weeks like this and Secretary Kerry will not need to spend as much time in Geneva as expected this summer.